Numerous cases of unarmed black men dying at the hands of the US police have sparked national protests and unrest across America, bringing the issue of police brutality to the fore. What’s causing the violence and is there a way to put an end to it? We ask a man who was a street dealer before turning himself around to become a high-ranking officer in the NYPD, author of ‘Once a Cop,’ Corey Pegues. Sophie Shevardnadze: Corey Pegues, veteran of the New York Police Department, author of ‘Once a cop’, welcome to the show it’s really great to have you with us. Corey, at least 300 black people were killed by U.S. police in 2016 alone - this makes them three times more likely to be killed by the authorities than white people. 70 per cent of the time, these people weren’t armed or dangerous. How can these statistics be explained? Corey Pegues: First of all, thanks for having me! Traditionally in the United States of America black unarmed men have been killed at an enormous rate compared to non-black Americans. And this issue is something that police has to take control of, to get a grip on, like, really soon because no longer can the police control their narrative because videos are out there and you see a lot of recent cases just in the past few years. Videos are helping enhance these case and hold police officers accountable for their actions. At least they are going to trials. I think that they are thinking a little more now before they pull their gun out and start shooting someone. SS: If a police officer fears for his or her life, they are allowed to shoot - this essentially gives them the power to be the judge and executioner at any given moment. How do you understand when to take this kind of authority? CP: Well, let me just clarify: whenever a cop fears for his life it doesn’t mean that they have to shoot someone. You can always retreat, you can run, you don’t have to shoot. You shoot if you feel that your life is in imminent danger or someone else right there is ready to use deadly physical force. If you don’t have that, if there’s no imminent deadly physical force being used against you or another right now, you are not allowed to shoot. SS: But Corey, on the other hand, police have to be ready to face a person with a gun - according to the latest PEW research polls, gun ownership levels in the U.S. have increased to 44 per cent. Is that why officers feel that sometimes they have to pull the trigger? CP: No, the rate of the amount of guns in America doesn’t weigh on a cop when they’re getting ready to engage in an individual gun battle. Like I said, previously, the only time is that they see a gun, finger is on the trigger, somebody is about to start shooting at them or someone is imminently causing deadly physical force to occur… If that’s not happening, it doesn’t matter how many people are carrying guns - cops or the ones that are supposed to be out there patrolling area and getting guns off the streets. I’ve been in situations when people pulled out guns and I didn’t fire and that person didn’t fire. And we disarmed them and arrested them. That happens everyday in NYC and around America. SS: But you know what also happens a lot? People reach for wallets or water or phone and they get shot because police officers somehow think that they are reaching for their gun… What about those cases? CP: Yes. Remember, you’ve got to understand, in defense of police officers these are split-second decisions that they are making, and then, after these decisions occur we set back, we have a lot of time, we can sit down and we view it. Now, in order for a cop to stop shooting unarmed people, one of the first things they need to do in any situations is to get behind some cover or concealment. You know, cover buys you time, gives you an extra second or two to make sure that’s a wallet or a soda bottle or a candy bar. But if you’re standing in the middle of the street and someone reaches in their back or their waistband the cop is not going to sit there giving them the benefit of a doubt because people shouldn’t be reaching for their waistband when cops have guns turned on them, saying: “Police! Don’t move!” So these are split-second decisions, some of them are tragic decisions. The cops are overzealous in my opinion and in opinion of a lot of people in America. But cops should be behind cover or concealment, because that buys you time and gets you to analyse the situation before you start firing. SS: Police officers are not always punished for violence - statistics by ‘mapping police violence’ suggest that 97% of cases do not result in a police officer being charged. Why? Are juries inclined to side with the police? Does that create a sense of impunity for certain members of the police? CP: No, when we talk about the disciplinary system, I think, it’s flawed. You’re talking about cases that go to a jury. That’s my personal belief and the belief of some people out there, that if a cop is involved in a shooting there should be a special prosecutor that comes in and enhances the case. You shouldn’t have the local district attorney prosecuting cops because district attorneys and cops are pretty much lying in bed together. Again, in my opinion, how hard are they going to go to prosecute a police officer? It’s just like the case in Staten Island when Eric Garner, who we all saw was murdered on television, and a medical examiner said it was a homicide by asphyxiation. The district attorney out there in Staten Island didn’t try hard to get an indictment. It’s very easy to get an indictment of anybody in America. He didn’t try hard because he didn’t want to get an indictment. SS: You’ve said in the beginning that videos help in situations with police shootings now. A lot of incidents become public knowledge almost instantly - thanks to police cams, surveillance, social media. But with all these recent cases, why doesn’t this help curb the violence? CP: It hasn’t helped curb the violence because... Again, police departments have to hold these cops’ feet to the fire. And district attorneys have to put on strong cases when in fact you can see that there were some misdoings by the police officer. Now, in black and Hispanic minority communities all they are asking for is like the Freddie Gray case down in Baltimore. All six cops were acquitted of the crime. But at least they went to trial. Before cameras cops were killing people, unarmed black men were dying and nobody was to be held accountable. At least now, when I say that cameras are helping, we’re seeing it on the video, and they are actually going to court and are put on a trial either by their peers or a judge. That’s all we can really ask for now. But inside, internally these police chiefs and superintendents need to start firing these cops, there need to be more psychological evaluations, maybe every three to five years. I mean, I was a cop for 21 years. I had one psychological evaluation in 1992 and then in 2013 I retired and had another one. So, in 21 years nobody ever asked me: “You saw all of these things going on, you were commanding officer in one of the worst precincts in the city, you saw a lot of dead bodies, are you ok? Are you alright?” And that’s what they need to do because you can start weeding out these police officers. SS: Is it hard for black police officers to speak out? Are they more apprehensive about speaking out about the wrongdoings of their white colleagues - or perhaps not sympathising with black communities? CP: I think, it’s a little bit of both. No one wants to be ostracised. And that’s one of the problems. You know, throughout my career, as you know - you’ve read the book, I’ve been outspoken since I became a police officer because I knew where I came from, I knew what my ancestors went through, I knew that Malcolm X and Martin Luther Jr. paved the way for me, they spoke out and made it possible for me to even be a police officer. But some of these cops, black officers, get to the police department and they want to fit in. They want to be part of that blue wall and they keep their mouths shut because it’s all about them. But for me it was always about who’s coming after me, how is my family going to feel, I’ve got to be the father of my house, a hero to my kids… So I couldn’t go to work and not see something and not say anything. That just doesn’t work for me. But a lot of black cops out here are just going along to get along, because they’ve got a house with a white picket fence and a car, and it’s all about them. But it’s not about them, it’s about us. It’s about young black men and women, Hispanic minorities out there being abused. And let me just make no mistake to doubt about that, that an overwhelming majority of cops out there do the right thing, they’re are doing their job everyday. But we need to weed out the bad ones because the bad ones give everybody a very bad name. SS: But it’s also known that police officers who report wrongdoings in their units are labeled ‘rats’ by their fellow cops. Is there a cover-up culture inside the police force? CP: Oh, yeah, they’re labeled ‘rats’. But that’s why police departments have to have, you know, like, in NYPD we have Internal Affairs which is a watchdog for corruption, and when people make allegations against other cops, they protect it. They’ve got to have mechanisms in place in these police departments or give them incentives. How about, whenever a cop gets in a shooting they promote him to detective? How about promoting a cop that breaks the case of three or four rogue officers in that precinct? How about lifting him or her up? You’ve got to make incentives because if you don’t have incentives nobody wants to stand out being on the frontline, speaking about something, and be ostracised. I did it all the time, and I was ostracised, but I didn’t really care. It wasn’t about me, it was about us and making sure that I protected people like me when I was working in that community. SS: As a police officer, and part of America’s largest police force - the NYPD,- I realise that you probably feel a sense of responsibility to the black community and the authorities. Where does this distrust come from between the police and minority communities? CP: The distrust is quite evident, the distrust is because, I always say, in black communities they hunt, and white communities - they protect and serve. This is no secret. If you look into stop-question-and-frisk which is, you know, something that’s major and was ruled unconstitutional by a federal judge, you’ll see that 90-95% of those stops were black males, Hispanics, and if you put it on the map, it’s all in black and Hispanic communities. And it’s not only black or Hispanic communities - white people commit crimes too, there are drugs. We’ve got the opiate issue here in New York in Long Island. They commit crimes, but they are not getting stopped in white snow. So they are targeting our communities. And when you target a community, you break the distrust. That’s how you get the distrust between the cops and the minority community. There’s no one trusting police at the certain point, there’s a segment of a community that just doesn’t trust the police. SS: The Defence Department hands military equipment to police across the country - why is this happening, what do police in a small town need armoured vehicles or machine guns for? CP: That’s been the major issue now, ever since the Ferguson. In Ferguson we saw the police rolling around in tanks with MP5 machine guns. And we don’t need that. Let me just be clear. You can have that type of equipment, but you don’t need to bring it out when this is absolutely unnecessary. When we look at these police departments rolling in tanks and MP5 machine guns strapped to their back, Kevlar gear, it looks as if Ferguson was Iraq, and that’s not the case. You need to be able to articulate and talk to people, build relationships. That’s how you stop these riots - by building relationships. You can’t have a riot and don’t have any connections to the community because that’s going to be a real riot where you are going to be jumping on cars, breaking into houses, and then you’re going to be forced to bring that stuff out. Do they necessarily need it? You know, I look at NYPD. We have all the best equipment in the country. We have riots, but you’ll never see NYPD rolling down in black armoured trucks because we build relationships out here with important people in the community. You don’t need all of this equipment in urban environment. SS: Black officers make up only 12 percent of all local police officers (those are the figures from 2015) - and the number is not growing. Why aren’t black people joining the police force as much, are they prevented from joining? SS: Hold on, Corey. You joined the cops, you were willing to become a cop. You served 21 years. Why did you want to do it? What made you do it? Why can’t others do it just like you? CP: Well, others can do it, and they need to have that opportunity, like I said. I can speak for the NYPD, and I know people in the investigations unite that are weeding out black officers at such a high rate than non-black officers. It’s hard to get those numbers up, but I know of countless young black men and women that want to be police officers. They’ve just had a test recently, or there’s a test coming up, a lot of people signed up for the test. The NYPD closed the filing like fourteen days before the end. It was supposed to be to the end of January, and they closed it on, like, January 14-15. So now you’ve got all of these minorities thinking that they could file up till January 31, and they closed it. So that’s another way or trick to not get people to apply, and then say: “Hey, we’ve only got this small segment.” And that’s not true, because people are going out to churches and they speak to community-based organisations - churches and schools - trying to recruit black young men and women. CP: Yeah, well, they didn’t try to indict me for a crime. I was important to crime. We’re talking about that old case when a cop was murdered. So the discrimination is there. The NYPD always say “the minority out of majority”, meaning that they’ve got more minorities than they have of anybody in the police department. But what I look at is the power positions. When you look at the top of the police department, the commissioner is white, the chief of the department is white, the chief of detectives is white, the chief of Internal Affairs is white, the chief of Anti-Terrorism is white. Those are power positions. So you can have a bunch of black and Hispanic cops running around in the street but they have no power. So when you talk about power, I need to be in the policy making position where I could change something. The highest rank for the black police officer in the NYC police department is in charge of housing. Do you know what housing is? Housing is like all the low public housing for the project. So they put a black man in charge of the projects. He doesn’t have power. He’s not in charge of the New Year’s Day Parade. He’s not in charge of Thanksgiving Day Parade. He’s not in charge of anti-terrorism. He’s out there dealing with these issues of the house development of the black and Hispanic people. I don’t buy it a fact that there’s minority of the majority. Majority is when you have power. When you have power you can make change. SS: There’s another thing that I’m also wondering - why is someone like you, who’s turned their life around from a street dealer to a top cop deemed a threat to the NYPD? I mean, shouldn't​ your story be an inspiration? CP: It’s funny to me that you say that because a lot of people say that. I mean, I’m a true American success story: from where I came from to where I am now, from things that I’ve done… I mean, my mother didn’t have a high school education, my father didn’t, a couple of older siblings didn’t, I’ve got a few degrees. I’m an American success story. The last crime I committed was 1987, 1988 or something. I mean, almost 30 years I’ve been clean as a whistle. I’m doing some phenomenal things in the community. They should respect me. When they talk about that they have issues with recruiting minorities, I’m the guy who they should be consulting with, taking me to the projects or housing development, setting me up with churches and stuff. I resonate with the people. When I speak they listen. They know that I come from where they came from. I can tell them: “You can do a great job if you come in; your mind is focused, you can do some great things.” My daughter is a cop, and I love her for being a police officer because we can’t keep saying that we don’t want to be cops. We won’t be able to effect change unless we come in there. But as long as NYPD has a chip on their shoulder about Corey Pegues, it doesn’t really bother me. I don’t hate NYPD, but they should utilise my skill set. And my skill set is going to black communities and motivate and encourage young black kids to do the right thing and join the job ‘cause that’s how you can make a change. You’ve got to be in it to win it. SS: Killings of black men by police sparked ‘revenge’ shootings - there have been several instances of black men shooting white policemen. Can a radical element emerge from this movement against police brutality? And if yes, how do you keep it at bay? CP: Are you talking about radical Islam, terrorism? CP: I truly doubt that that would happen. That never really happened. When you look at these police shootings, very small segment of black cops are shooting white perpetrators. It’s very small. As a matter of fact, around America an overwhelming majority of cops who shoot and kill people are white cops. They shoot and kill white people, black people, Hispanic people, Asian people. It’s usually a white cop doing that. It’s very rare. And you know, what’s really something that you don’t really understand and know? In the history of the NYC there’s never been an on-duty white officer shot by an on-duty cop. But there’s been several on-duty black officers who were shot by cops who worked in NYPD because they had plain clothes on. What happens is that when a cop sees a black man with a gun he sees a criminal. When they see a white man running down the street with a gun they give him that split-second to identify himself as a cop. But when you have an off-duty or an on-duty black cop in plain clothes trying to take action these cops are out there shooting at them for no apparent reason whatsoever and not giving them a chance to identify themselves. We had Omar Edwards lost like that, Desmond Robinson who got shot like that. And there are a few others that I could name. SS: You were heading up one of the most violent precincts of NYC, you say you saw a drop in crime. Was it your background that helped you in that? How did you behave differently from a typical precinct director? CP: Thanks for saying that, and that needs to be noted. Every year that I was commanding officer for about 5-6 years I had decreasing crime every single year. I wanted to believe that my background, definitely my DNA has certainly something to do with it. I was working in the communities of color, in the black communities for most part. I knew how to resonate with the people. But it’s not just that. I held cops’ feet to the fire. They knew that if they went out there and did something crazy or something that was against the rule they had to deal with me. I was going to take vacation days from them, recommend termination, suspend them on the spot. So my reputation preceded me, they knew I wasn’t playing games. We’re going come to work, we’re going to treat these people - yeah, in this low-class area - but we’re going to treat them with respect because these are just the circumstances in life that was put on them and they live it. But that doesn’t mean that you treat them like they’re the scum of the earth. 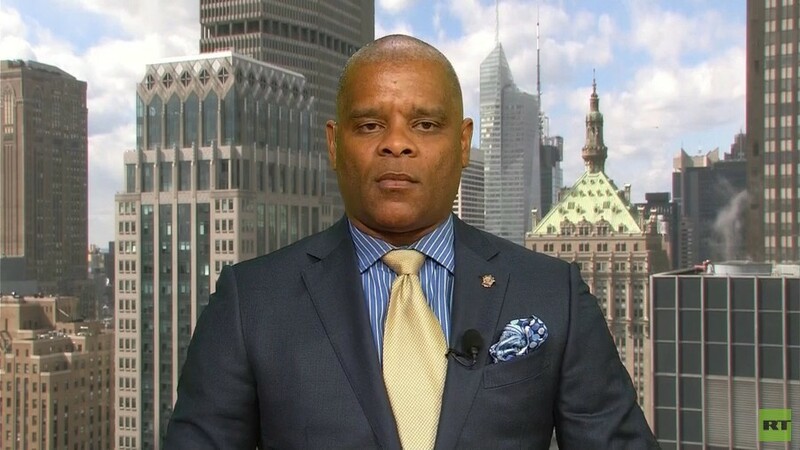 SS: We’ve been talking to Corey Pegues, a veteran and NYPD officer who spent 21 years on the force, author of “Once a Cop”, discussing the issues of racial bias in the police and its thorny relationship with the African American communities in the United States.